We're back from our weekend in Suzhou. 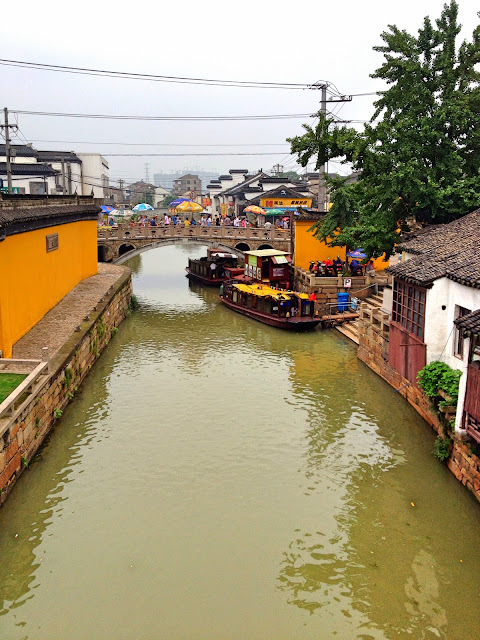 I'll write more about it later, but I have to share how there are hundreds of water towns in eastern China, several of which we have visited, with more on our list of places to go. The funny thing they all have in common is how they each proclaim they are the Venice of the East. Now I've never been to the actual Venice, only the Disney version at Tokyo DisneySea in Japan, which is a pretty spectacular copy. And honestly, I've never really wanted to go to Venice. But now that I've been to a dozen Chinese versions, I must admit I'm curious about the Italian original. Because frankly many of the water villages we've visited have been so stunning in their simplicity and authenticity, that I fear I'm always going to have a bias toward Asia. Suzhou is a place I'm definitely going to need to visit again. Considering the bullet train got us there in 30 minutes for just over $5.00 USD, I think it's a realistic option when I feel I need more water than just the river which runs alongside our home here in Shanghai. Not that the water was any less polluted-looking, but there is something special about a city which is criss-crossed by as many canals as roads. It just feels like home. And considering every home I've lived in since birth has been near water, whether river, lake, ocean, sea, or pond, you can understand why I'd think that. I must be part mermaid, right?